Renmar was founded in 2007 by Kevin Horne, primarily to serve as the UK agent for the Amut Group. In the following years, the company quickly added product lines from manufacturers such as the ACS Group, Virginio Nastri and Pulsotronic. To enable Kevin to spend more time visiting customers, his son Dan joined the company in 2010, shortly followed by his daughter Kristy. Increased business meant that the company quickly outgrew its small office in Sywell and relocated to its current facility in Wellingborough. This is where we met with Dan. Renmar now offers a wide range of ancillary products, including but not limited to granulators, shredders, mould heaters, belt conveyors & systems, robots, dryers, loaders, dosers, and metal detection equipment. We asked Dan which particular product lines were the company’s primary focus at present and over the coming 12-months. The company will be promoting their equipment at the Recycling & Waste Management Expo at the NEC in September, as well as exhibiting on the PlastikCity Pavilion at PDM in June. Finally, we asked Dan if the company had an official or unofficial philosophy or mission statement? 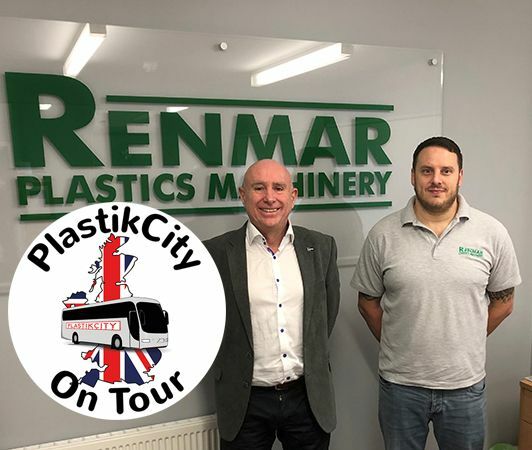 Look out for the next edition of ‘PlastikCity on Tour’ to learn more about our excellent UK based Partner Companies. There are now well over 200 active Partners represented on the PlastikCity site, many of which offer highly specialised products or services to our sector. During our everyday course of business, we’ll be making a point of visiting as many of these partners as we can and using the time to better understand what they offer the market. We’ll then showcase them through this ongoing series of articles. Maybe you can benefit from their services!